You don’t have to be Irish to celebrate St. Patrick’s Day! Here are some fun ways to celebrate and enjoy the day! Ever since I was a little girl, I’ve loved celebrating St. Patrick’s Day. I’m 25 percent Irish and I have played up that 25 percent every single year. I’m all about wearing green loud and proud! I learned from watching my grandmother, a little lady who is 100 percent Irish. She wears and celebrates her Irish pride all year long, so you can just imagine what St. Patrick’s Day was like in my house growing up (and I loved every second!). As soon as March rolls around, I start looking for some new and fun ways to celebrate St. Patrick’s Day with my sons. My sons get very into it, too. I actually pretend that Lucky the Leprechaun stops by our house at night and moves things around. I hide things and say that whoever finds the missing items is lucky for the day. It’s a little thing that I love to do and my sons absolutely get a kick out of! What can I say? I love bringing the luck of the Irish into my family. So what am I loving this week when it comes to celebrating St. Patrick’s Day in some chic, trendy and super-fun ways? I’ve found some cool ways to bring on the fun, the celebrating and the green! If there’s one thing I remember from my childhood, it was wearing my “Kiss me I’m Irish” pin. We all had them in our family. I distinctly remember my mother wearing it every single year. If you’re Irish, grab one of these pins and let your kids smack a kiss right on you! Tons of fun, smiles and free kisses from your family. Oh, moms, don’t get mad at me for this one! It’s temporary and just for total fun. I’m all about following the trends, and seeing so many celebs right now with dyed hair (e.g., Kelly Osbourne and Katy Perry), it’s just another way to bring on the green for St. Patrick’s Day. My son Alex wants me to give him a green mohawk. I’ve been a lover of feather hair extensions for over a year now. I think they’re such a cool and chic way to bring some extra pizzazz into your hair, so why not have some fun by adding some green ones in for St. Patrick’s Day? Such a great beauty trick for young girls — they’re easy and temporary! 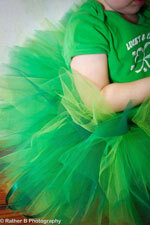 As a mom of all boys, I’ve never been able to buy a tutu for a little girl, but if I could, I would! For a little lady in your life, this is the perfect and most festive attire for her. I can assure you, wherever you take her on St. Patrick’s Day, you will be stopped and oohh’ed and aahh’ed over continuously. Sweet as can be! Every year I buy St. Patrick’s Day themed jammies for the boys (okay, Lucky the Leprechaun buys them) and we end the day with a sleepover party. They all pile into one of the boys’ rooms and hang out together. 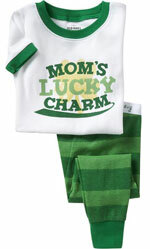 This year I found jammies that say “Mom’s Lucky Charm.” There’s just something about seeing their eyes light up with a special gift to end the day with!